It’s that time of year again for my favorite and most robust list of the top 100 sites and apps of the year. As with the previous year’s list, more mobile apps are making the list. The following sites and apps are all new. Any product that was included on a previous year’s list will not be on this one. 2. *Otus: A fantastic and easy-to-use 1:1 learning solution for mobile classrooms (i.e., iPads and Chromebooks). Educators can manage and create student accounts, take attendance, grade, and assess students in real time, and much more. 3. *Pixel Press Floors: An amazing iOS app for game-based learning that allows students to create their own game by drawing. 4. Answerables: A super fun and innovative site that brings game-based learning together with a learning management system to provide a safe environment for students to learn any subject in a 3D virtual world. 5. *Stick Around: A great iPad app that can be used for project-based learning or flipping a lesson by creating puzzles and diagrams and having students label them. 6. *Rosetta Stone for Kids: A wonderful, free iPad app for kids ages 3-7 who are learning how to read. 7. WordWriter: A new learning tool from the award-winning collaborative writing site, BoomWriter. Using BoomWriter’s innovative collaborative process, students can learn and develop their reading, writing, and vocabulary skills. 8. geddit: A fantastic, easy-to-use learning tool that lets students use their mobile device to answer questions with a tap of a button in real time. 9. Glean: An excellent site for finding educational videos and lessons on math and science. 10. *TowerStorm: An innovative, free iOS game that takes place in a 3D virtual world designed for grades 2-10 for math and literacy. 11. Tackk: A great site with an educational portal that allows educators to create student accounts where they can create static pages filled with dynamic media. 12. ThingLink: A wonderful site and app for students to tag images with multimedia content such as text, audio, or video files. 13. GoNoodle: My favorite site around for giving students “brain breaks” during class through educational and fun activities and videos. 14. Gooru: A great place for students to find study guides on a wide range of subjects that are aligned to Common Core standards. It’s also ideal for personalized learning. 15. 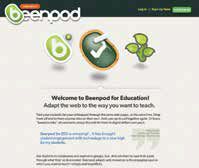 Booktrack Classroom: An excellent site and app for adding a soundtrack to students’ writing. Also, it’s a nice place to find Common Core-aligned lesson plans. 16. Pear Deck: A cool educational tool that interacts with Google Chrome and Google Drive to create interactive quizzes, slideshows, and presentations. 17. News-O-Matic: A terrific, free mobile app designed to bring five Common Core-aligned articles to students. 18. Prodigy: A fantastic, free, online math game aligned to Common Core standards for students in grades 1-6. Best of all, this game differentiates instruction and educators can track students’ progress as well as generate detailed reports. 19. Citelighter: An online, K-12 writing platform that helps students organize and research for papers and homework. Also, educators can monitor, add assignments, and grade students. 20. *Plickers: A unique, free, mobile app that acts as a student response system, by using QR codes and mobile devices to answer and respond to questions. 21. *Math with Amigos and Healthy Heroes 1: Two of my favorite educational iOS games that are ideal for game-based learning in basic math and health. 22. *Chronicle: A unbelievable iPad app for helping teachers with their best teaching strategies by “chronicling” each student through notes, videos, assessments, and much more. 23. *Voice Dream: The best text-to-speech app I have ever seen, with an abundance of features such as highlighting, definitions, bookmarking, and more. 24. *AR Flashcards Shapes & Colors: Space: Excellent iOS app that uses augmented reality to bring interactive 3D objects to life to teach about shapes, colors, and outer space. 25. *Teachley: Mt. Multiplis: Players build bridges in this computational math game to help students build their multiplication skills. 26. *Book Writer One: A free and easy-to-use iOS app for creating digital books. This is a great way to introduce digital storytelling to the classroom. 27. 30hands Learning Community: An ideal, easy-to-use, cloud-based LMS that lets educators assess, collaborate, and grade students in real time. 28. *WeLearnedIt: An excellent, free iPad for the mobile classroom, ePortfolios, and project-based learning. 29. NameCoach: An interesting free site for teachers wanting to learn student names and the proper way to pronounce them. 30. *Word Clouds by ABCYa: A terrific, free iPad app for creating word clouds. 31. *Drawp for School: A wonderful, free iPad app with an educational portal and cloud storage for creating beautiful-looking projects. 32. *Grid Lines: Ordered Pair Game: One of my favorite iOS apps for game-based learning that uses a familiar Battleship-style game to practice plotting points on a graph. 33. RoomRecess: A excellent site for finding free educational games for El Ed students. 34. *Ask3: One of my favorite free iPad apps for adding narration to an image to visually explain any topic. This is ideal for creating a flipped classroom. 35. *GuidedVideo: A wonderful iPad app for guided learning where educators can create questions with images based on the answers that students provide. 36. Kahoot: A fantastic free tool that combines game-based learning and a student response system to bring a fun, easy-to-use, real-time assessment tool to the classroom. 37. Edventure Builder: An innovative new site that is perfect for sparking students’ creativity by providing an online platform to create scavenger hunts, interactive stories, or choose-your-own-adventures stories. 38. *Write on Video: A great iPad app for digital storytelling that allows users to upload a video and then annotate, draw, or add images. 39. Photos for Class: The easiest way to find safe Creative Commons-licensed photos for the classroom that are cited appropriately. 40. Flashcard Monkey: A fun way to learn vocabulary with cartoon-based flashcards. 41. *Magical Mental Math: A super fun iOS game designed for grades 2-6 that helps students to work on their basic math skills. 42. *TeleStory: An amazing new iOS app for digital storytelling that lets kids star in their own TV show. 43. *Write to Read: A iPad app designed for students 3-10 years old to help develop their reading and writing skills by creating a digital book. This app is also aligned with Common Core standards and is ideal for introducing digital storytelling. 44. Modern Chalkboard: A wonderful, free site for finding free interactive SMARTboard lessons for your digital whiteboard. 45. *Exam Elf: A fantastic, free iOS app that helps students develop basic math skills while developing test-taking skills. 46. *Tell About This: A great iPad app for digital storytelling that lets students record their voices to visual prompts. 47. *Xnote: An innovative iOS app for geocaching that takes going on a scavenger hunt to a whole new level. 48. *Tocomail: A excellent site and app that provides a safe “filtered” email environment for kids. 49. *PICME: A nice, free iPad app where kids “star” in their very own digital story by placing their faces on the main characters. 50. *Quiz Dungeon: A wonderful iOS game that helps students learn basic math through an RPG-style adventure. 51. *Hideout: Early Reading: A great iOS app for young readers looking to develop their reading skills in such areas as word recognition, sounding out words, finding the letters, and more. 52. *Zeus vs. Monsters / Math vs. Dinosaurs: Two excellent Android apps for learning basic math skills by fighting off mythical creatures and dinosaurs. 53. *Tynker: A free iPad app that teaches students how to program and code by assembling blocks together (i.e., Scratch). 54. *Letter Battle: A super fun iOS app for learning how to spell in an RPG setting. 55. *Bluster: A free iPad app that helps students develop their vocabulary by playing a multiplayer game. 56. *Chromville: A fantastic mobile app that uses augmented reality to have students complete a fun-filled, 3D adventure. 57. EverySlide: A great way to take a presentation and make it interactive by sharing a unique access code. 58. *Kid Screen Time: An excellent schedule and timer for an iOS device that alerts parents when their child’s time is up. 59. Ginkgotree: An innovative way for students to take any kind of print media (e.g., textbook) and digitize it to make it their own. 60. Penzu Classroom: A wonderful, safe site where educators and students can create an online journal, track and grade assignments, and more. 61. *ZooKazam: This Web site brings 3D animals to life in this beautiful, interactive augmented reality iOS app. 62. Hooda Math: A great site with over 50 math games for grades K-12. 63. FlipSnack Edu: A new Web 2.0 site with an educational portal that allows educators and students to create and deliver online content in a safe way. 64. Matific: A nice, all-in-one, match site for finding a wide variety of worksheets, videos, activities, and more. 65. FlashDecks: A cool and easy-to-use site for finding and creating digital flashcards. 66. *Imagistory: A free iPad app where students record and narrate their own “wordless” picture book. 67. *Book Builder: A free iOS app that acts as a “choose-your-own” adventure where students select how the story is going to progress. 68. PortfolioGen Classroom: An excellent site with an educational portal that allows students to create digital portfolios in a safe environment. 69. *Toonia Storymaker: One of my favorite iPad apps for digital storytelling, where the more students play, the more features they unlock. 70. *Math Monsters Bingo: A fun, free iOS game for learning basic math in a Bingo-style game. 71. *Teachable: A nice productivity iPad app that helps teachers plan, track, and organize their classrooms. 72. ClassWallet: An interesting new site that allows educators to electronically manage and organize classroom funds. 73. *littleBIG History: One my favorite timeline apps for the iPad that covers areas from the Big Bang Theory to Current Events. 74. *Little Story Creator: A wonderful new iOS app for scrapbooking or digital storytelling. 75. Wizenworld: Uses game-based learning to teach Common Core math skills in an RPG action adventure setting. 76. *Angle Asteroids: A fun iOS app that helps students learn how to measure angles in the old “Asteroid”-style arcade game. 77. *Brainfeed: An excellent iPad app for finding safe and educational videos for students. 78. Classcraft: This program brings the mega-popular PC game World of Warcraft to the classroom to promote game-based learning. 79. *Flipgrid: An “adult” version of Voicethread where educators can ask a question via a video and students can respond. 80. Fishtree: A new, innovative, digital learning platform that allows educators to curate and create lessons for their students. 81. *Speaking Times Table: A fun iPad app for students wanting to learn and practice their multiplication tables. 82. *Math Hunter: A wonderful iOS game for basic math skills with replay value in this adventure-filled, bow-and-arrow game. 83. Bouncy Balls: A great way to monitor classroom noise through balls bouncing on a screen. 84. *Common Core Quest: An excellent, free Android app aligned to Common Core standards for practicing math and language arts tests and problems. 85. *Reading Raving: A great iPad app for beginning readers where they progress from letters to phonics to reading full sentences. 86. *Speech Wizard: A terrific iPad app for ESL, parents, or teachers looking to help students with their articulation skills. 87. *Classkick: An interesting new iPad app that allows educators to gather, assess, and provide real-time feedback to students. 88. *Door 24: A wonderful, free iPad app for basic math skills aligned to Common Core standards for grades 4-8. 89. ProcessOn: A great site for brainstorming or mind-mapping in real time. 90. ClassFlow: A cloud-based learning platform that teachers can use to create digital lessons that can be viewed on browser-based devices. 91. *Sticker Story: A fun iPad app for digital storytelling through the use of stickers. 92. *Verso: A great way to flip your class by creating lessons students can view and respond to from home. 93. *Slidebean: A nice site and app for creating beautiful presentations with lots of templates to choose from. 94. *Elevated Math: An excellent, free iOS app for finding animated math lessons on a wide variety of topics. 95. Poindle: A nice free tool for educators to schedule appointments. 96. *MarcoPolo Ocean: A wonderful iPad app for young learners wanting to interact and learn about the ocean. 97. Comment Bubble: A neat little site where a user uploads a video and then selects what type of feedback others can give (i.e., text, audio, or video). 98. *Puzzlin Pieces USA: A fantastic iPad app designed for students 6-8 years old for learning the geography of the United States. 99. *Piiig Labs: An iPad app that teaches young kids about science by performing different scientific experiments. 100. TwistedWave: A nice, online audio editor that integrates with Google Drive and SoundCloud.